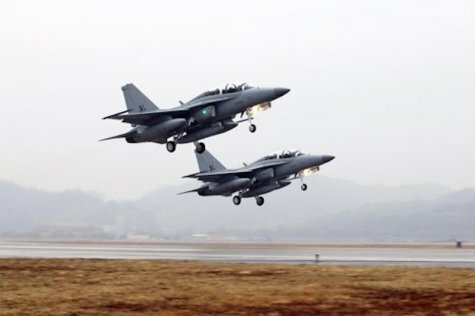 SEOUL --- Korea Aerospace Industries Co. (KAI), the country's sole aircraft manufacturer, on Monday began delivery of its advanced T-50 trainer jet to Thailand's air force. KAI received two separate orders to build four T-50TH trainer jets worth US$110 million in 2015 and eight T-50TH jets valued at $260 million last year. Two of the first four trainer jets will be delivered to the Southeast Asian country via a 12-hour ferry flight, the company said in a statement. The aircraft manufacturer has exported a total of 64 T-50 trainer jets worth $2.9 billion since 2011, it said. The company is currently pushing to export the advanced jet to the United States, Argentina and Botswana, KAI said.